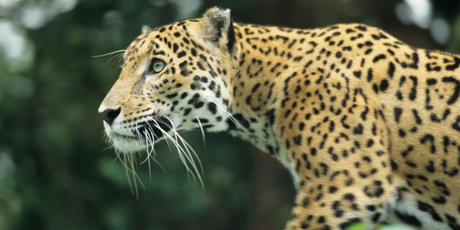 Jaguars lurk near a luxurious forest retreat. Brilliant birds fill the sky above. But which species will Ben Ross add to his Life List? Roni Martinez is conservation officer at Blancaneaux Lodge, a gracious bit of tourism infrastructure in a particularly peculiar part of Belize. Take those pines, for example. Much of this country is clad in broad-leaf rainforest, damp and exotic, full of orchids and bromeliads, strangler figs, vines and creepers. Huge palms stretch upwards. Ferns shoot sail-like fronds up to the canopy. Below all the dripping vegetation lies soft limestone, riddled with caves and cenotes, once thought by the ancient Mayans to be the gateways to the underworld. However, the area around Blancaneaux, known as Mountain Pine Ridge Forest Reserve, is a geological oddity. It’s a huge granite massif, which means acid soil: no good for rainforests, but perfect for the Honduras pine, with its long, elegant needles. There’s still plenty of moisture around, but the hard bedrock sees the rains flow straight off the land into rivers: the Macal, Rio Frio, Rio On and Privassion Creek, which flows past Blancaneaux in cascades of swirling brown. It’s as if Scotland has been displaced to Central America, pumped up with sunshine and hung with termite mounds and wasps’ nests. The off-kilter familiarity is all the more intriguing when you learn that hiding among the pines, securely camouflaged in the dappled shade, are jaguars, the largest of Belize’s five wild-cat species. Elusive, magnificent, spotty, they dine on armadillo and paca (a kind of burrowing rodent). They are also, according to Roni, attracted to Calvin Klein’s iconic fragrance. Or not, of course. Let’s get this out of the way now: I failed to spot a jaguar during my time in the wilds of Belize, and it is highly likely that should you visit, you will fail to spot a jaguar too. Neil Rogers, a tourism consultant who has a long association with Blancaneaux Lodge, has been coming to Belize since 1989. He has never seen a jaguar in the wild. He can spot big cat tracks, though, at one point asking Roni to stop the 4×4. We all crouched next to a set of sizeable paw prints, with parts of a dismembered grey fox nearby, the jawbone gleaming pale against the red earth. Paw prints, then, but no paws: you’re about as likely to see an E-Type cavorting over these rutted trails as you are to see the real thing. According to Roni, the odds don’t improve particularly should you be keen to spot any of Belize’s other wild felines: the puma (pale and interesting), the jaguarundi (like a big red house cat), the ocelot and the margay (both spotty, but smaller than jaguars). On a cat-scanning night walk close to the lodge, the rain hissing on the canopy above, we saw nothing bigger than butterflies and leaf-cutter ants. It’s all very different in the morning, though, when Belize hits you right between the ears. Round here, dawn breaks with what sounds like a flock of squeaky garden gates passing overhead. Then some clicks, some whoops and the beginnings of free-form jazz noodlings: clarinet trills, trumpet calls. The local bird-life is awake, abundant and demanding your attention. Fuelled up on coffee and a determination to see Belize’s national icon, the keel-billed toucan, I met up with Geraldo Garcia, a guide at the lodge, for a 6am birdwatching session. Geraldo made up for my non-existent twitching skills with a running commentary on what we were seeing and hearing. Those squeaky gates? Red-lored parrots: green, with a vivid scarlet patch above the beak. The jazz-player? A melodious blackbird, as giddy with song as it was understated in dress. Serious birders compile Life Lists of all the species they ever encounter – and if you want a head start, Belize is the place. The names came in a rush from Geraldo, like creatures from a Roald Dahl children’s story: the yellow-winged tanager, the red-legged honeycreeper, the black-headed saltator, the boat-billed flycatcher. We saw a yellow-bellied sapsucker drilling holes in the lodge’s almond trees, a golden-hooded tanager perched on the green spread of a vast cecropia. Plain chachalacas rustled in bushes near the swimming pool, like small turkeys. Hummingbirds, magnolia warblers, the masked tityra … blink behind your binoculars and you’d missed another exotic flash of colour. The green jays were my favourite, with their lemon-and-lime two-tone bodies and blue heads. No toucan, though. Geraldo was apologetic: he’d find one for me, he said. Just wait. I found it easy to believe him. After all, in an hour we’d seen dozens of bird species, yet we’d walked no more than a couple of hundred yards from my empty coffee cup. With the rising sun came a chance to explore the lodge itself. The property is owned by Francis Ford Coppola Resorts, part of an empire built up by the film-maker that stretches from wineries in Napa Valley to hotels in Italy via a literary magazine and a range of pasta sauce. The director of Apocalypse Now! and theGodfather trilogy also owns Turtle Inn, which brings barefoot luxury to the coast of Belize, and La Lancha in Guatemala, for those keen on a close-up of Tikal, one of the largest excavated Mayan sites in Central America. Blancaneaux makes a captivating retreat: 20 thatched two-room villas and single-room cabanas set up on stilts and spread along one bank of the river, next to a churning waterfall. The resort has its own airstrip for those keen to avoid the often dubious roads nearby. Most of the power comes from a hydro-electric system just below the property. Inside the rooms, the emphasis is on simplicity: dark mahogany floors and hand-made tiles in the bathrooms; trinkets sourced by Coppola and his wife on their travels in the Philippines, Mexico and Bali. It seems odd to be recommending the pizza, but seriously: try the pizza. The wood-lined Montagna Restaurant features traditional Italian dishes based on Coppola’s family favourites. He’s very specific about his wood-fired, thin-crust margheritas, apparently. For local flavour, there is the Guatemaltecqua Restaurant by the pool, serving Guatemalan dishes such as salpicon (shredded beef salad) and jocon (chicken cooked with herbs and spices). Everything is made using produce from a two-acre organic garden that rises in great tiers of fruit and veg, all ripening furiously in the tropical heat. Blancaneaux seems intent on stripping out the frippery of a luxury hotel and focusing on the important things: splendidly comfortable beds, a hot-water bottle at night, locally sourced unguents placed on palm leaves in the bathrooms. Each evening, guests choose their preferred activities for the next day: horse-riding, perhaps Blancaneaux has its own stables or taking one of the complimentary mountain bikes to Big Rock Falls, where you can swim in the deep, dark pools.